Pediasure Nutritional Drinks are a nutritionally complete, balanced supplement designed for children 1 to 10 years of age. PediaSure may be used as the sole source of nutrition or as a supplement. These nutritional supplements meet or exceed 100% of the NAS-NRC RDAs for protein, vitamins and minerals for children 1 to 6 years of age in 1000 mL, and for children 7 to 10 years of age in 1300 mL. When your child needs additional calories or nutrition, PediaSure Nutritional Drinks can help. They're a complete, balanced source of nutrition with extra calories, plus the protein, vitamins and minerals needed for healthy growth. PediaSure and PediaSure With Fiber have been improved to better provide your kids with the Complete, Balanced Nutrition they need to grow strong and healthy. PediaSure is also ideal for those who miss out and do not complete their meals or who are picky about what they eat. PediaSure is a high energy yield beverage to meet the increased calorie needs of active children. PediaSure is also fortified with MCTs for better digestion and absorption, providing a quick source of energy for active children. 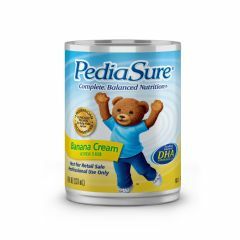 Pediasure Precaution: Pediasure is not intended for infants under 1 year of age unless specified by a physician. Note: PediaSure is also available as an enteral formula, designed especially for tube feeding. This product contains less sucrose and is lower in osmolality than flavored PediaSure. First meal of day. Simple To Take. Good Taste. My children leave for school to early to eat, and don't always like what they have at school so this takes the place of that sometime missed meal. They grab a can and drink while waiting for school bus. Produces Results. Simple To Take. Good Taste. Acts Quickly. Produces Results. Good Taste. Simple To Take. Acts Quickly. For the child who dosent like to eat! Have your child drink one can every morning! my son did not drink milk from his birth.he is 3 years now.Can he drinks Pediasure.Now he eats some milk based food like sweet.So can he drink Pediasure. Could someone send me the Nutrition Label of Ensure for kids?